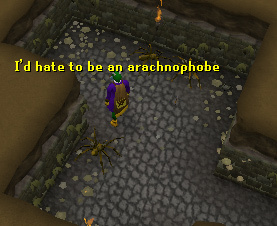 Welcome to the Varrock Sewer! This area is very interesting with many different attractions, despite the revolting odor you may encounter. 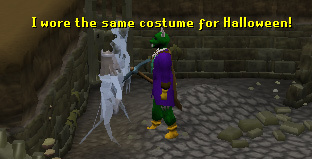 Start off at Varrock, easily accessed by using the Varrock Teleport spell (requires 25 Magic, three Air Runes, one Fire Rune, and one Law Rune) or simply by walking. 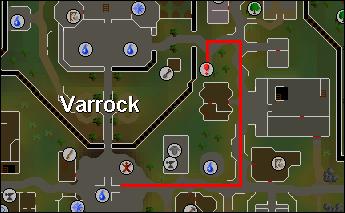 If you have unlocked the Varrock lodestone, home teleport there (requires no runes or level) and walk north then to the east side of the castle walls. The manhole, acting as an entrance to the sewer, can be found northeast of Horvik's Armory. 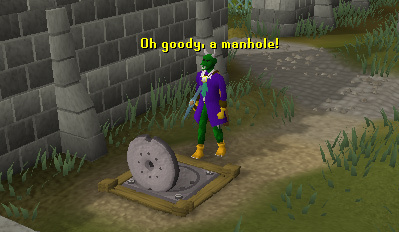 When you climb down the manhole, you will find a large area inhabited by some level 2 Rats and three level 10 and level 14 Giant Rats. They are popular monsters for training on in the sewer. In the northwestern area, just south of a small stream of water, you used to be able to find Sir Prysin's key if you were doing the quest, Demon Slayer. 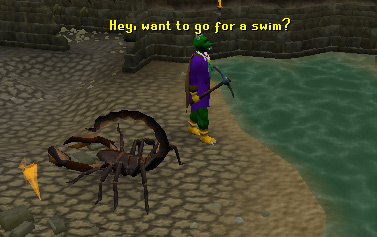 However, the quest was revamped and no longer involves Sir Prysin or the Varrock Sewers. In addition, members can find Phingspet and Grimesquit, two women who play a role in the Rat Catchers Quest. Heading north through the eastern passage, you will come across a couple of level 18 Zombies. You can also see a few level 2 Rats scurrying about. North of the Zombies, you will see some level 20 Scorpions, some more Rats, a dead tree which you can chop down, and a small stream. If you continue southwest, you'll arrive at a small room with two level 14 Giant Rats. North of that is a room with a rack with a corpse beside it. Proceed northwest and you'll come across a few level 24 Skeletons a couple of dead trees, a small bed, and the stream you saw earlier. These Skeletons are trained on often because they are often maged from the other side of the stream. 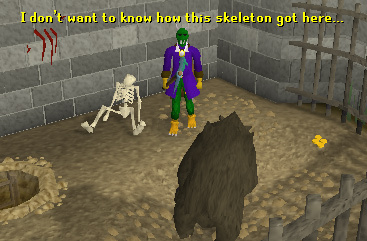 Just west of the Skeletons, you will come upon a small room filled with some level 36 Ghosts. Continue southwest and you'll discover an area with a respawn of one Mind and one Body Rune. There are also some level 32 Zombies. 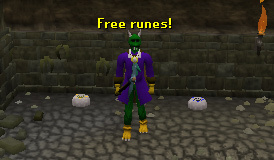 These Zombies can be trained on across the stream from the area you used to be able to find Sir Prysin's key. You'll also spot a ladder you can climb up. If you climb up the ladder you just saw, you'll stumble upon a cage containing a dying tree you can chop down, two respawns of three and four coins, and a level 46 Grizzly Bear. 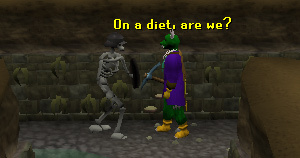 Continue west and you'll arrive at a room with two level 46 Skeletons. To the south of the room is a web. You'll need a sharp blade (e.g. scimitar, knife) to pass through it and continue through the sewer. 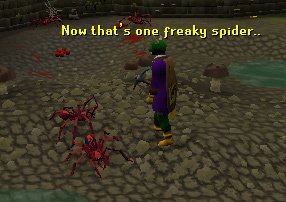 Once you make it past the web, to the southeast you'll come across many level 2 Spiders and level 48 Giant Spiders. You can also find a Knife respawn. 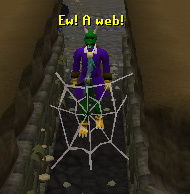 You can use a Knife with the web to cut through it. Continue west along with the small stream of water and you'll arrive at a very large room filled with level 136 Deadly Red Spiders. They are popular to train on. There are also many coin respawns, a respawn containing six Earth Runes, an Iron Axe respawn, and two Red Spiders' Eggs respawn. 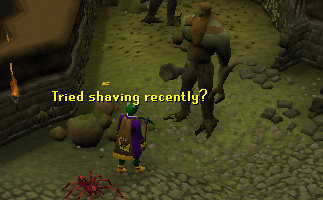 Red Spiders' Eggs is an ingredient used for making Strength Potions if you give it to the Apothecary in Varrock, along with Limpwurt Roots and five coins. To the west there are two rooms containing level 74 Moss Giants. They are trained on very often. The northern Moss Giant room also contains an Obstacle Pipe, which requires an Agility level of 51 to use. 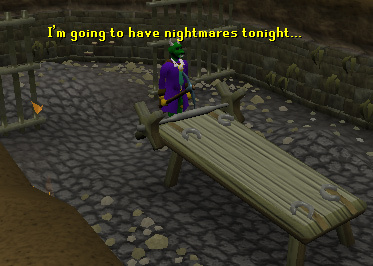 It leads to the Edgeville Dungeon.